Andres Floto has been appointed as Professor of Respiratory Biology from 1st December 2014. 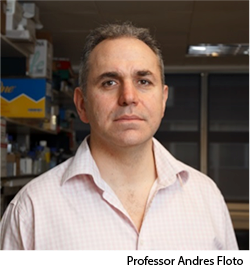 Professor Floto graduated from the Cambridge MB-PhD programme in 1997, having obtained a First in Natural Sciences and a PhD studying macrophage signalling. He undertook clinical training in London and returned to Cambridge in 2002 on an AMS/MRC Clinician Scientist Fellowship to Professor Ken Smith’s lab where he worked on immuno-receptors, antigen presentation, and autophagy. Since 2008, he has run his own group at CIMR (as a Wellcome Trust Senior Fellow) focused on understanding innate immunity to bacteria and how to modulate it therapeutically. He is Research Director and honorary consultant at the Cambridge Centre for Lung Infection, Papworth Hospital, where his translational research and clinical interests are in Cystic Fibrosis (CF), non-CF bronchiectasis and mycobacterial infection.